In truth, I could be totally content on my birthday with nothing more than a huge chocolate cake and watching my dog hate the party hat I make her wear. However, every year I like to put together a little wish list of things that I would be more than happy to receive for my birthday (because a girl can dream, right?) and this year has quite a strong theme. Considering I’m moving from the city of my birth (Melbourne, Australia) to Austin, Texas, many of the items are things I can see coming in very handy for my new adventure. I pretty much have to start from scratch, too, in terms of worldly possessions. Don’t worry, I’m bringing my favourite knives and my vintage skillet! I’m super excited to start my new journey based in Texas, and still plan on heading back to Australia to run Carnivores Ball and other fun events. Anyway, here’s what I’m coveting this year, maybe there’s something you think is neat too? The Art Of Beef Cutting. Quite related to the skull, I’ve been told this is the must have guide to understanding how to break down beef. I’m curious to see how it varies between Aussie and US cuts, too. Art by Brian Phillips. I have loved Brian’s artworks for years now, often spotting his distinctive designs around town at places like Gus’s Fried Chicken. I’m a huge fan of his state of Texas pieces made from reclaimed interesting wood pieces and now that I’m finally moving to the Lone Star State, I can hang one on my wall! Steer Skull. Sadly, unless I plan to apply for a permit from the FDA, my current steer skull (straight from the slaughterhouse complete with bolthole) has to stay in Australia, so I’ll be needed a replacement. It was a toss up between this and buck mount. Rib eye steaks from 44 Farms. Are you kidding me? 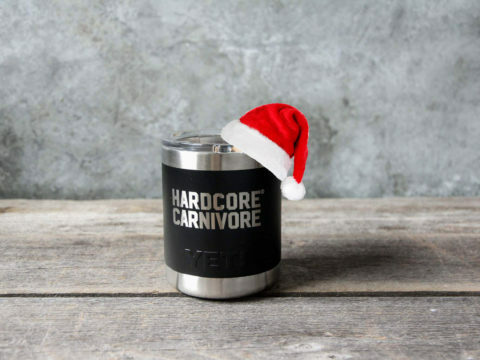 Who wouldn’t want the gift of meat?! In this case, hormone and antibiotic free, Texas raised Black Angus shipped via the folks at Four St James. Perfect candidates for a reverse sear. High Times & Good Rhymes. The new album from Austin’s own Mayeux and Broussard. Ok, technically I already own this, and really just wanted to share it with you because it’s badass, but anything from the back catalogue will do. Kitchen spice box. Brilliant idea for storing salt (which I use all the time in the kitchen). Swivel lid keeps it covered but is easy to push out of the way for access if you have meat covered hands. Wooden cutting board. It’s chunky and sturdy, made from Louisiana Sinker Cyprus and handmade in New Orleans (and the natural grain is gorgeous). There’s something super satisfying about working in the kitchen with a wooden board – until now I’ve only used bamboo so I’m looking forward to upgrading. DistilUnion iPhone wallet. This is a matter of sheer practicality. Let’s face it, you can’t drag a giant purse out on the dancefloor when you go two-stepping. Solution? Cards and phone in one holder, slipped into a cowboy boot, ready to cut a rug!